With more cockpit area than many larger boats and her well-balanced hull design, the 2550 fishes and runs like a 27-footer while offering the easier trailering of a 25′ boat. We gave the Anniversary Edition a host of special features—such as gunwale boards with toe space below, increased storage, a modular electric system with high-water alarm—and a list of other features you should see to appreciate. 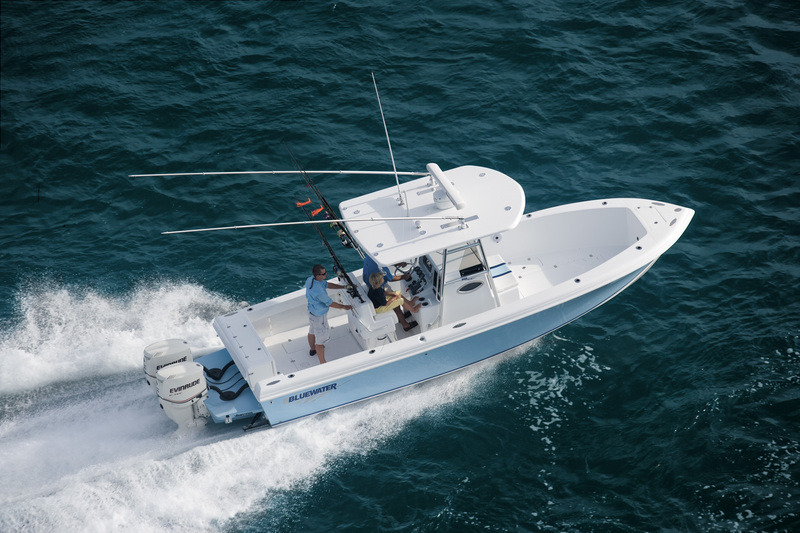 Fishing features include a transom-mounted 35-gallon live well, four large, insulated fish boxes (two aft, two forward) and a large centerline fish box/ storage compartment with rod holders for up to seven rigs. The console has a lockable electronics box along with ample in-dash space to flush-mount critical electronic equipment. With her step-through transom, an optional swim ladder and multiple options for configuring the huge amount of storage space, the 2550 also makes an outstanding dive boat. Like all Bluewaters, her Multi-Plex stringer system, bonded to the hull in the mold, gives this boat exceptional hull strength and rigidity. With a 178-gallon fuel capacity and flat, smooth, dry ride even in bumpy conditions, you can take the 2550 100 miles offshore to the tuna grounds or your favorite island dive sites with complete confidence. To view the Bluewater 2550 gallery click here.